Classical Connections: Efrem Kurtz and the KC Philharmonic take a stand against racism. Efrem Kurtz and the KC Philharmonic take a stand against racism. I came across this brief passage about the Kansas City Philharmonic and their conductor, Efrem Kurtz, while reading a book about race relations in Kansas City (cited below). Maestro Kurtz conducted the orchestra from 1943 to 1947. He had a long and distinguished career that began in 1920, lasting until his death in 1995. Kurtz was Jewish, and no stranger to discrimination and persecution. Born in Russia in 1900, he fled during the Revolution and settled in Germany. By 1933, fearing arrest by the Nazis, he fled to France, and eventually came to the United States in 1943 and became an American citizen. [Performances by the Kansas City Philharmonic were barred to blacks altogether. Ruth Seufert, chairwoman of the Philharmonic, explained that she was not color prejudiced herself. “I have a colored maid,” she offered as proof. “And I think the world and all of this maid. And this is the truth, sometimes she eats at my own table with my family. So you see I do not feel any discrimination because of color.” Unfortunately, Seufert told a Call reporter, she had to comply with the wishes of contributing patrons, many of whom did not wish to share a concert hall with black audience members. However, neither the Philharmonic nor their conductor, Efrem Kurtz, approved of the Jim Crow policies. After the Philharmonic’s Board of Trustees agreed to sell tickets to African Americans in 1943, the orchestra scheduled a performance by African American singer Carol Brice, over trustee’s objections, and registered a firm protest against a seating policy that sold tickets to black concertgoers, yet confined them to the upper balcony]. -From A City Divided: The Racial Landscape of Kansas City, 1900-1960 by Sherry Lamb Schirmer. In order that the RECORD might show the range of his achievements, I ask that there be included at this point the entry of Efrem Kurtz from ‘‘Current Biography,’’ 1946, at which time he had just begun conducting the Kansas City Philharmonic. Finally, I would ask that a flag be flown over the Capitol in his honor and presented to his widow]. [Kurtz has been called ‘‘the finest of ballet conductors,’’ but although he enjoyed his work with the Ballet Russe, he readily admitted his preference for symphonic conducting. 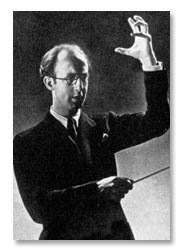 In the autumn of 1943, therefore, he accepted an invitation to become conductor of the Kansas City Philharmonic Orchestra, to succeed Karl Krueger who had left for Detroit. The next season Kurtz was re-engaged for another two years. His first thought on taking over in Kansas City, he has said, was how to bring his music to the masses, how to make them come to understand and like it; and despite opposition he began to offer ‘‘pops’’ concerts featuring good music at very low prices, annual free concerts, ‘‘name’’ soloists, and special concerts for school children in an endeavor to attract audiences. ‘‘The most important thing is to get them in,’’ he said, ‘‘and then sell myself and the orchestra.’’ The response proved that he was right, for by the end of his second season the orchestra was out of the red for the first time in many years and seemed well on its way to becoming self-sufficient. He moves Kansas City audiences, it is said, because ‘‘he knows how to inject his dramatic flare into programming, at the same time maintaining the highest musical standards.’’ Both in Kansas City and during his guest appearances it is his habit to include modern compositions and the works of the Russian masters on his programs, and he has won commendation for his conducting of these works as well as of the standard repertoire. Kurtz has frequently programmed the music and been a consistent advocate of Igor Stravinsky, whom he has known for many years. He is likewise eager to foster new instrumental and vocal talent, in this regard being a sponsor of Carol Brice, contralto, and William Kapell, pianist, both of whom have been especially well received by the critics; and for 1947 he planned engagements for eight young American soloists during the Kansas City winter ‘‘Pops’’ season. In 1944 Kurtz’s Kansas City Philharmonic was selected as the first orchestra to be presented on NBC’s new radio program Orchestras of the Nation, with reappearances scheduled for the following seasons]. This is wonderful thank you for posting it. I saw Kurtz conduct a few times in England (Hallé Orchestra) and always thought extremely highly of him - but this adds a whole new reason to admire and like the man.